Scary Clown Sightings Increase, Is This a Viral Stunt for IT? Horror movies often try to get creative with their viral marketing campaigns, but a new rumor suggests that the upcoming IT remake may be taking things a bit too far. The movie, of course, centers on, Pennywise, one of the most terrifying clowns to ever be introduced into pop culture, so it makes sense that creepy clowns would be used in the marketing. But having people dress up like clowns and try and scare kids at parks, trying to lure them into the woods? That might be a bit much, but it also might be something that is really happening. Recently there have been reports of people dressed as clowns showing up near parks and apartment complexes in North and South Carolina. According to the reports, men dressed in clown costumes have been spotted in the woods, but they haven't been doing anything illegal, just being super creepy. A new theory about these incidents has surfaced over at Bloody Disgusting, and if it is true, that would leave these reports teetering on the edge somewhere between genius and psychotic. Just for some clarification, here is what Fox News has reported on the matter. "Two children in Winston-Salem, North Carolina, said they saw a clown who offered them treats like candy if they would come into the woods, WFMY reported. According to the kids, the clown was wearing white overalls, white gloves and red shoes, and had red, bushy hair, a white face and a red nose. A second sighting happened about two miles away later that same evening, and police received yet another call Tuesday morning. Authorities in South Carolina have tallied at least six similar sightings since the first incident was reported on August 21. So far, police in both states have turned up no evidence to substantiate the claims, but they are taking the reports seriously." Recently a Kickstarter page from two years ago was discovered, which is clearly some sort of viral marketing for the new Blair Witch movie, so the idea of subtle, creepy marketing for horror movies has precedent. Bloody Disgusting suggests that New Line Cinema could be coordinating these clown sightings and stories as some sort of publicity stunt for IT. Were it less threatening to children, it might be downright clever. Mama director Andy Muschietti is currently filming the movie now, so the timing would kind of make sense. But there really isn't a lot to substantiate the idea that this is a marketing campaign. Then again, there wouldn't need to be. The report suggests that New Line would never actually have to own up to this, were it actually a marketing stunt. Which seems to be true. 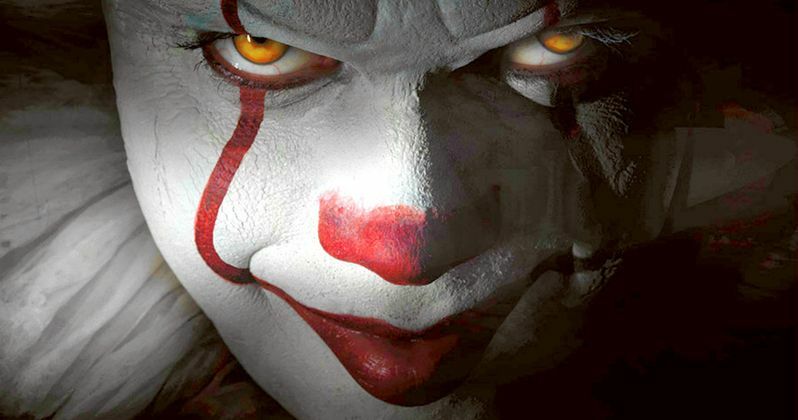 What they would accomplish is creating a renewed, nationwide fear of clowns ahead of the release date for the movie, which would definitely help to generate interest for IT when it drops next year. Is this far-fetched? Absolutely. Is it impossible? Not really. There had been some speculation that the creepy clowns could have been a marketing stunt for other movies as well. The other most likely candidate was the Rob Zombie crowdfunded horror flick 31. However, that is almost definitely not the case, as the Saban Films came out and denied any involvement directly. Here is what they had to say in a statement to WYFF News 4. "The company and the film '31" are not associated in any way with the creepy clowns and costumed characters found roaming the South." Stephen King's novel was previously adapted into a 1990 TV miniseries of the same name, where Tim Curry played Pennywise the Clown. This new IT adaptation will be split into two movies, just as the miniseries was split into two parts, with the first centering on a group of children known as The Losers Club, who must fight off this evil spirit known as IT. The second movie will bring these characters back together as adults, as they must stop IT once and for all. Bill Skarsgard leads the cast as Pennywise the clown with a cast that also includes Jaden Lieberher, Finn Wolfhard, Jack Dylan Grazer, Wyatt Oleff, Chosen Jacobs and Jeremy Ray Taylor as members of the Losers Club, with Owen Teague playing Billy, a psychotic bully who torments this group. New Line has set a September 8, 2017, release date for IT.